The 31 of March is Music For All's National Learn to play day, on which music shops up and down the country will offer free instrument lessons to members of the public. PRESS RELEASE: Music For All is proud to announce their National Learn to Play Day, which offers free musical instrument lessons to the public on 31 March 2012, will be supported by some of the UK's top rock stars. With over 60 music shops participating nationwide, Music for All can confirm that drumming legend Ian Paice of Deep Purple will be calling into Drumwright in Reading to lend a hand. 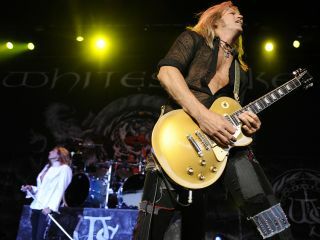 Elsewhere, Whitesnake's guitarist Doug Aldrich, Drummer Brian Tichy and bassist Michael Devin will be helping out at Sheehan's in Leicester. Commenting on the day, Ian Paice said "Being given the gift of being able to create music is an incredible thing and most people don't allow themselves this pleasure. That's a shame. Try it, you could just make your life a whole lot more fun". There are lots of other events all over the country including a special piano extravaganza by Markson Piano's at Foyle's Book, Charing Cross Road, London. Pink Floyd's Nick Mason also commenting on the National Learn to Play Day said: "Learning an instrument isn't about becoming a star, anymore than learning to swim means you want to become a haddock... It makes friends, teaches you the real advantages of working with other people to achieve a common goal, and provides an enormous sense of sheer pleasure when almost any music is produced. I've been doing it for over forty year and still love it." More music shops throughout the UK are joining in everyday, to find out your nearest shop please visit the official site. Information taken from official press release, for more visit Learn To Play Day.